I love making cards and when it was my friends birthday coming up, I know I had to make a cat card as she has the most gorgeous ginger cat. Me-ow! 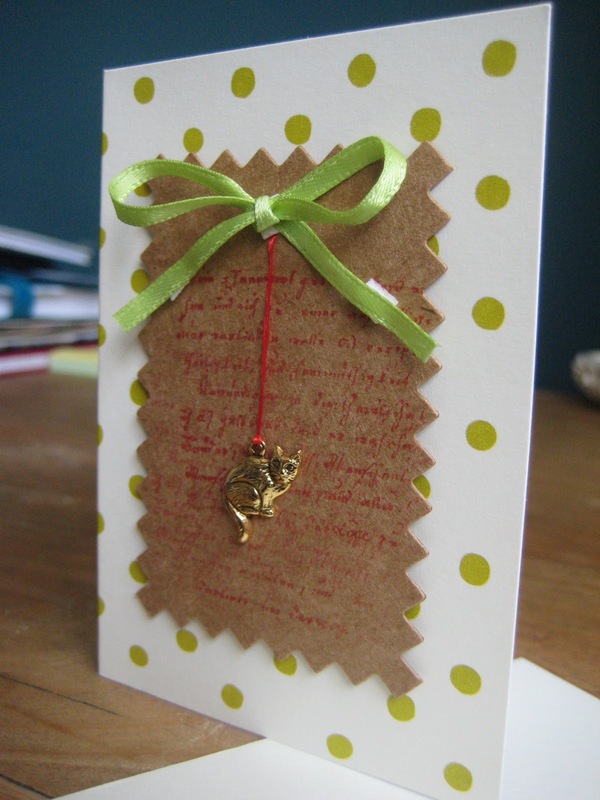 A cat charm card is perfect for any cat lover! 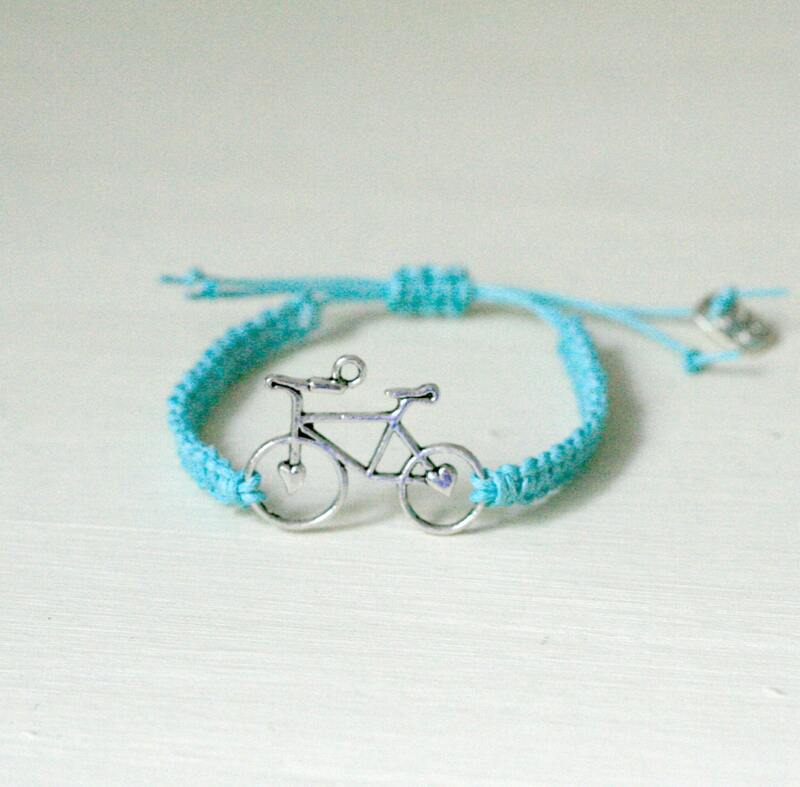 You will find the little charms on Etsy or Ebay similar to this one. Sometimes you need to ship from the Far East but my orders normally arrive in under two weeks. 1. I tied the cat charm to a length of embroidery thread. Then punched a card and fastened the thread at the back. 2. I then took a scroll effect rubber stamp and with red ink stamped a few times on the brown card background. 3. I stuck the brown card to the dotty card. 4. I took 20cm of green ribbon, tied a bow and stuck it over the hole punch with foam pads. 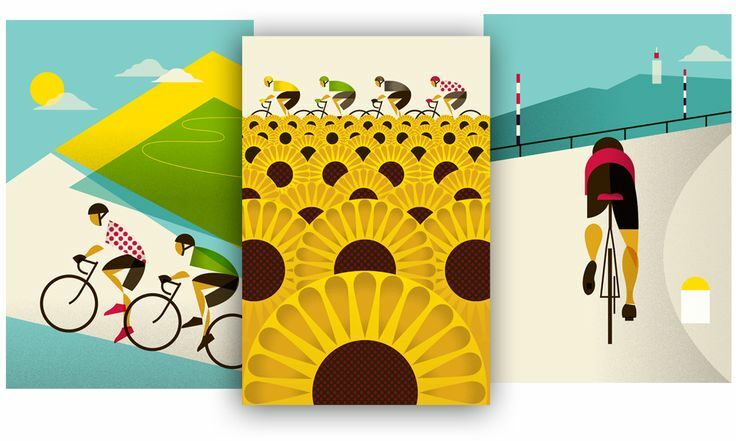 There are more creative ideas in the range, but for me it is all about the colours and good quality cards. 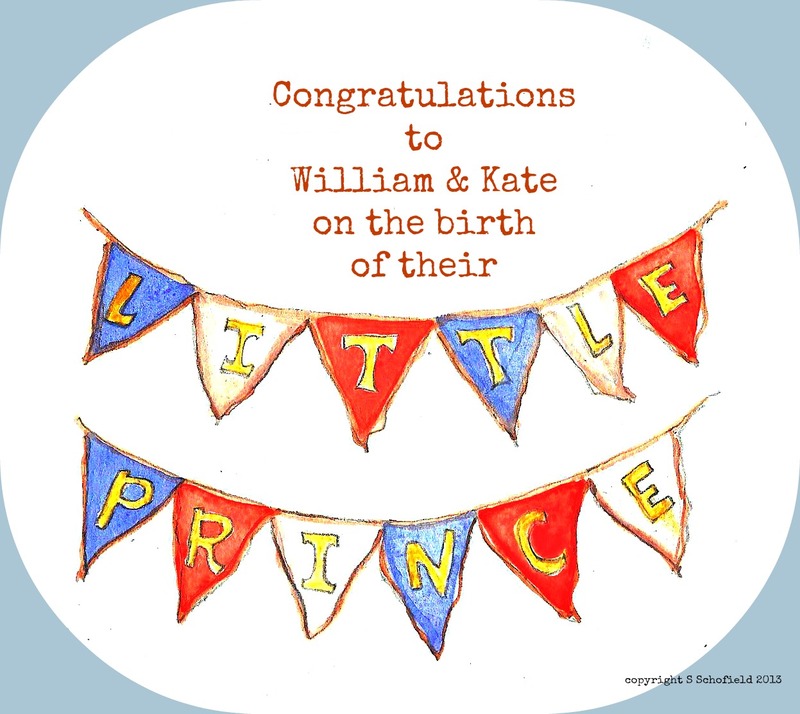 We are so happy for the safe arrival of our future King! 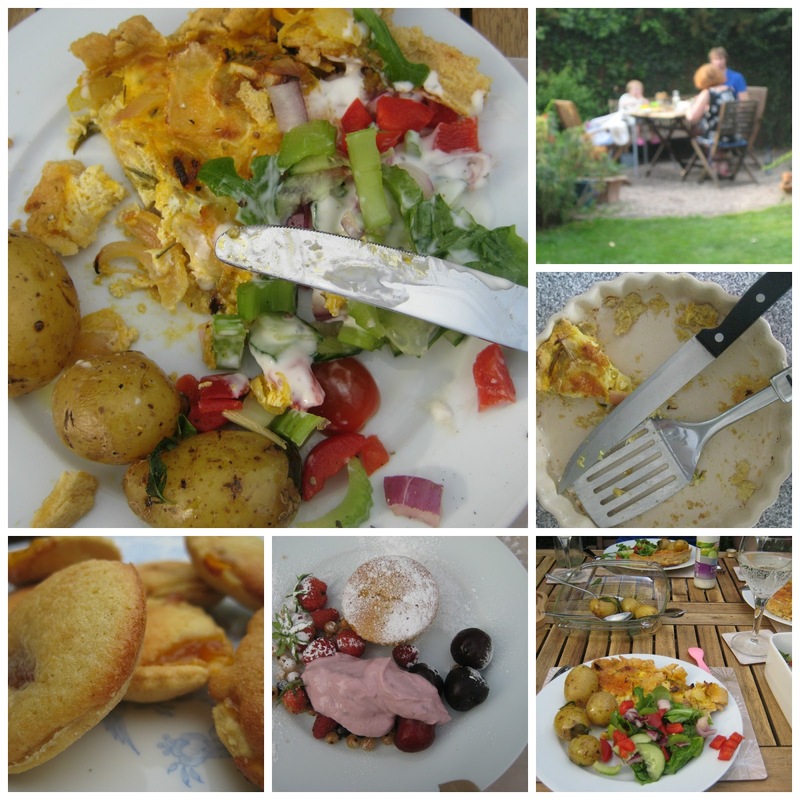 After Le Tour had finished on Sunday evening, we had a our French inspired supper. It was a good excuse to cook for food for the three generations of our family and bring us together. I cooked a brie and onion tarte with potatoes, apricot and almond pastries and almond sponges with fruit from the garden and fromage frais. 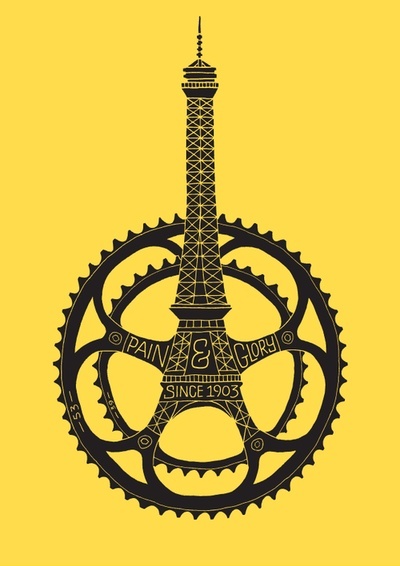 I worked for a French business before having Little L and used to love the amazing desserts we had in Paris; little tartes and pastries that looked too good to eat. What I love about the French lifestyle is that women can have a dessert and not feel guilt. More on this later. A meal of three courses and coffee is OK and you can enjoy your food. They must be doing something right as they are a leaner nation than us. I cooked the tarte and pastries in the morning so not to be in the kitchen in the heat of the day. Here recipe for the tarte tonight, desserts coming later. Rub together the butter, salt and flour until it resembles breadcrumbs. Add the cold water slowly to bind the ingredients to make a dough. Wrap in clingfilm and pop it in the 'fridge over night. Turn the oven to 180C or similar. Roll out the pastry, grease the tarte dish and lay the pastry in the dish. Bake blind (no baking beads) for 10 minutes until golden brown. Saute the onions until soft, add the herbs. A gorgeous smell! Beat together the milk and eggs until bubbly. Slice up the bric cheese. Then layer the onions, cheese and egg mixture in the tarte case. Serve with new minted potatoes and lots of crispy salad. Why French Women Don't Get Fat? As I mentioned earlier, it is a pleasure to eat and enjoy my food in France, dessert and all. You always need an excuse over in the UK to have dessert and why should you? If you eat sensibly and love your food in moderation then it's healthy. 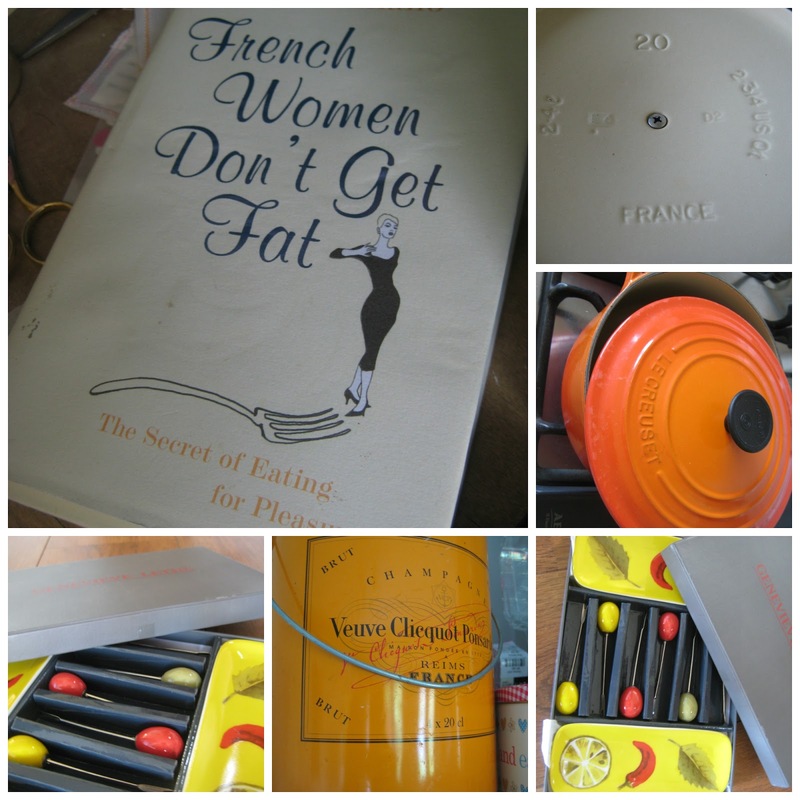 I love the book 'French Women Don't Get fat - the secret of eating for pleasure' by Mireille Guiliano. 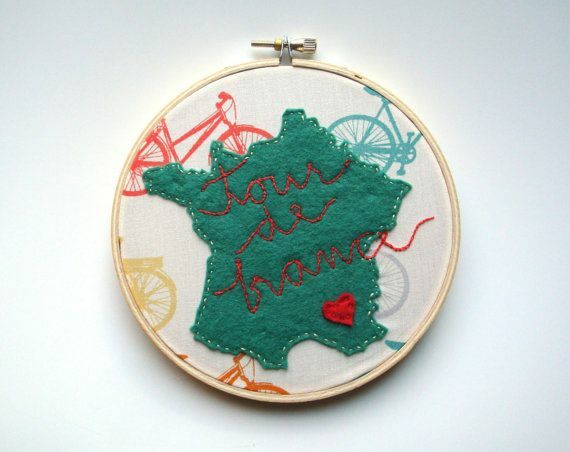 Check out the website http://frenchwomendontgetfat.com/ . I tried it about eight years ago and it changed the way I eat forever. Once you have cleansed your palette you then can enjoy food flavours and all. It has kept my weight down and even now I think a little bit of dark chocolate not the whole milk chocolate bar! Dark chocolate is better for you. It is great that my husband has the same philosophy about food. So I do enjoy my French slow cooking, my champagne now and again and using my pretty French dining ware we picked up on honeymoon to create great food. I will always remember by French colleague taking bread from the café back to the office to enjoy because it is 'beautiful bread', would we do this in UK? I think not. 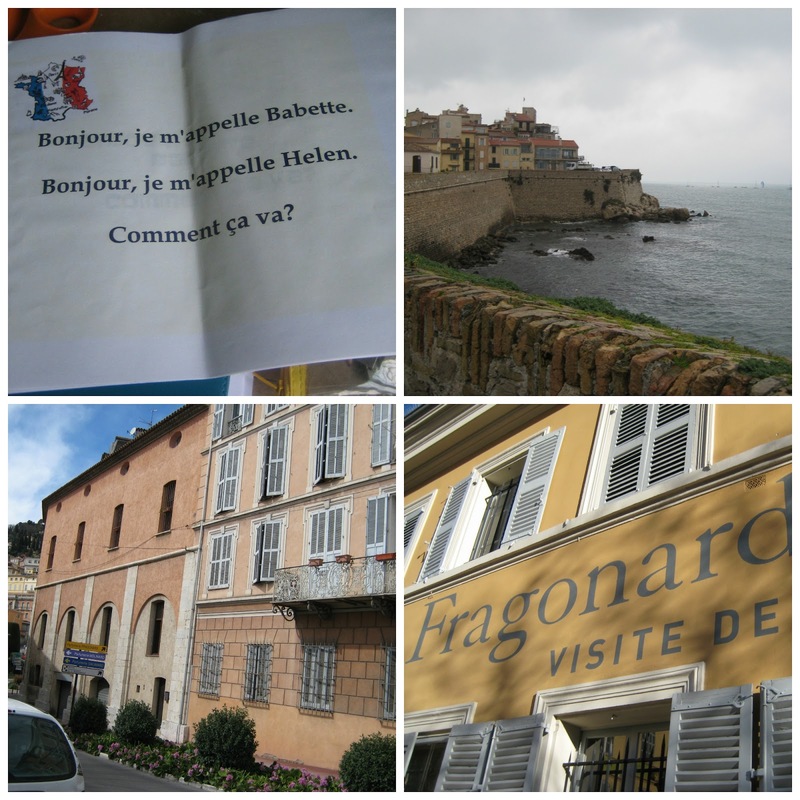 So, I hope I have inspired you to take a leaf out of the French culture with my post. 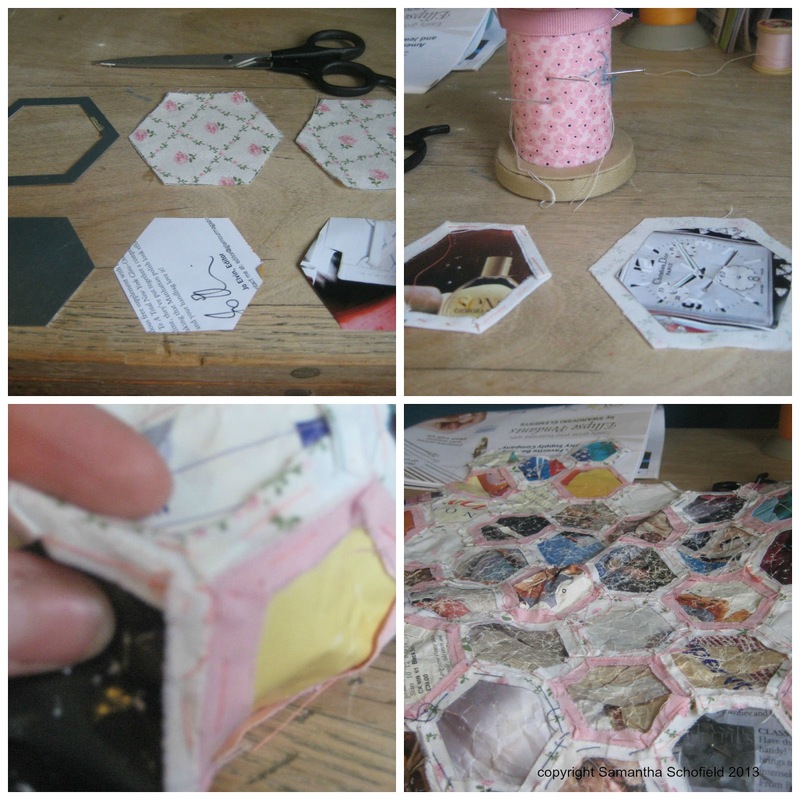 Today I need your help, calling all crafters out there! 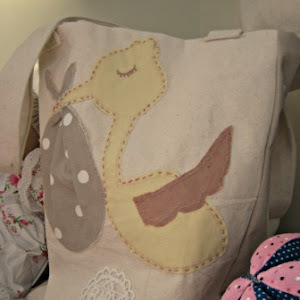 I am looking for new storage for my craft room as now my little L can grab, open and reach, the room is more like a nursery than a crafty space. My papers are pulled out of drawers and she is using oil pastels when she gets hold of them. The problem is that I cannot hide it anywhere. These little boxes are great for little hands! So my solution needs too be higher storage, on the wall, up where little hand cannot grab. You may say, close the door but I have cupboards I need to get at. So goodbye to little baskets and boxes and hello ..well that is the problem, what do I do? I saw this image on Adventures In Dressmaking on Instagram over the weekend and really like the idea of using wire spool and scissor storage way up high. Wall mounted seems to be the answer? So, if you have any solutions, drop me a comment? 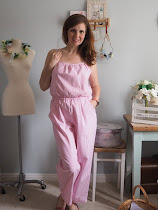 I am doing some research and a makeover is on it's way! 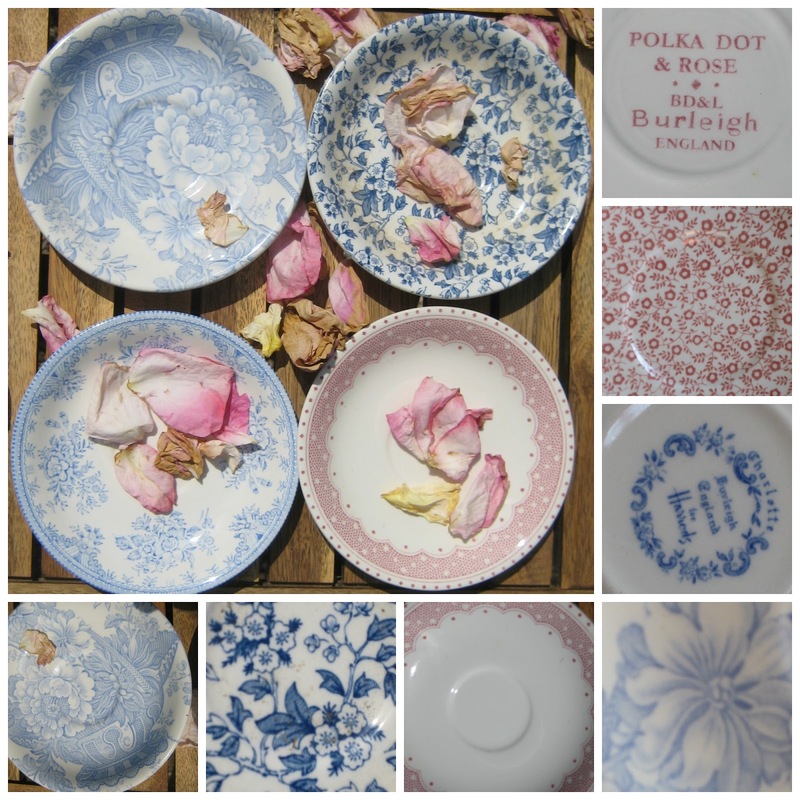 I love collecting these little old fashioned style plates from Burleigh Pottery . They are so pretty and a real inspiration for my designs. I use them in the home for potted plants, soaps or to put the odd flower on. Some are for Harrods and Martha Stewart collections, but they all seem to match, the dainty patterns are divine. I do have the tea cups but that is another post! 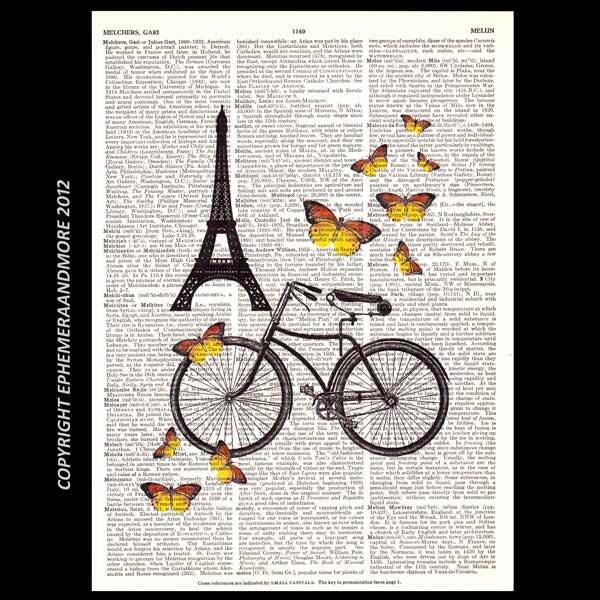 I love France and all things French, I know as a Brit I should hate anything over the channel but I don't. I worked for a French company until last year and I use to love my work visits for the culture, the food and the French way of life all packed into my short visits! I have recently been on a course to brush up on my language skills to make my holidays more enjoyable in France. 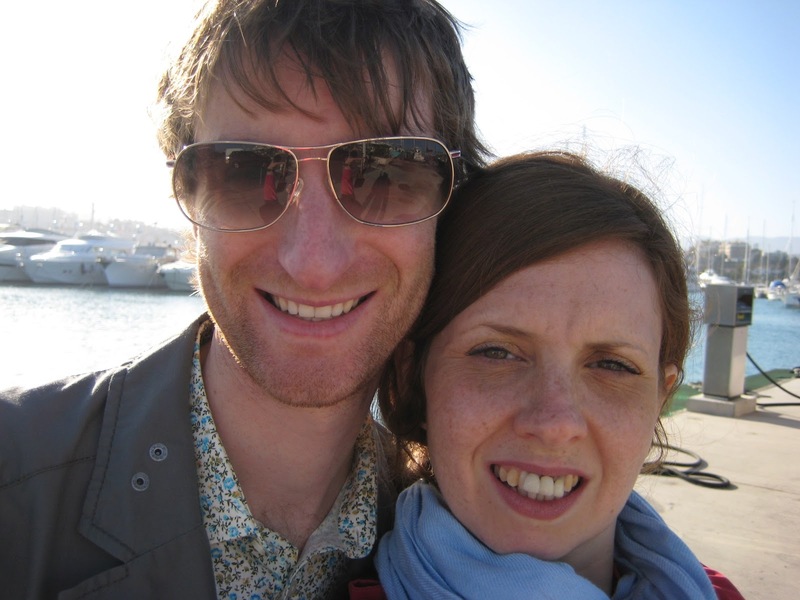 We took our honeymoon in France after Mr S asked me to marry him in France 18 months previous. So there is no question that our love for France is part of our relationship and we hope to keep discovering more with our new little family. 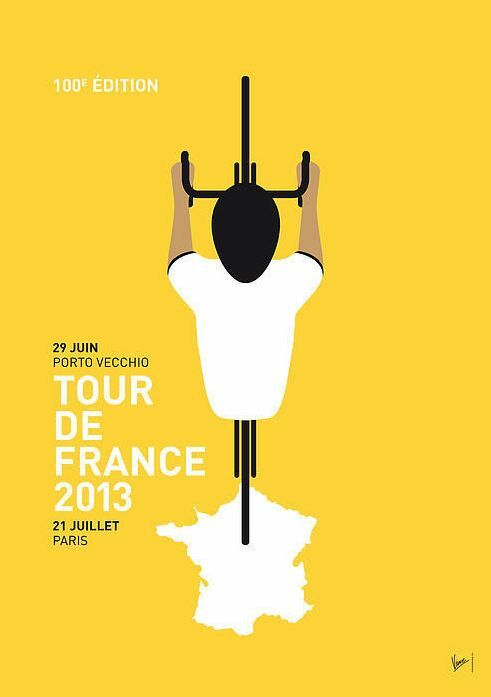 Today is a big day in France and to celebrate Le Tour 2013 is riding one of the most spectacular rides of the three weeks - Mont Ventoux . 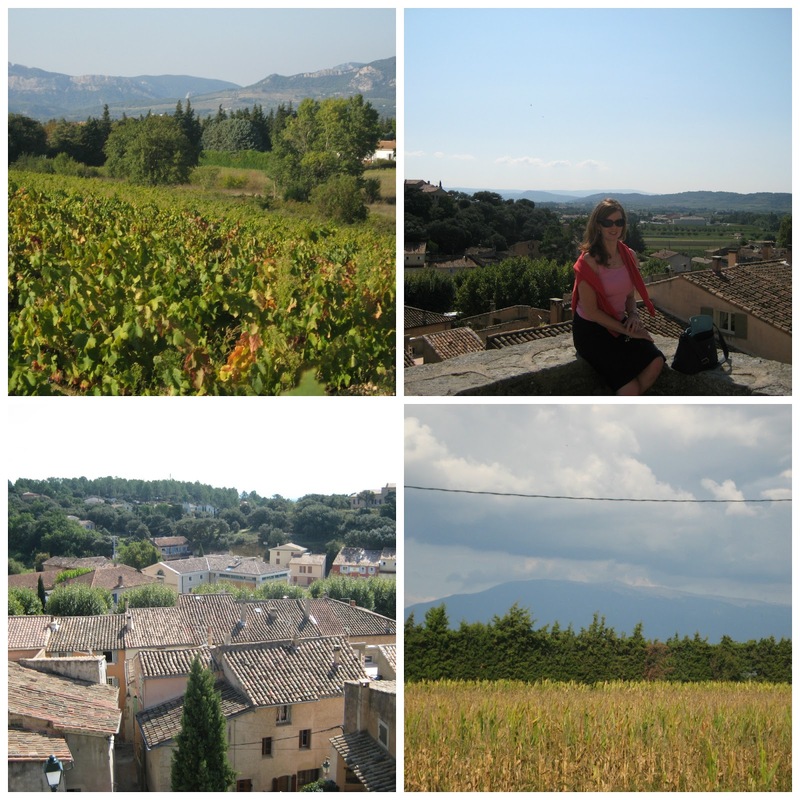 I have happy memories of the area as my boyfriend asked me to marry him two days before we arrived in Carpentras near Mont Ventoux. I said yes and never looked back. So to celebrate all things French here are some of my favourite French things in my life, I think that I may have to spread these out over a few posts. 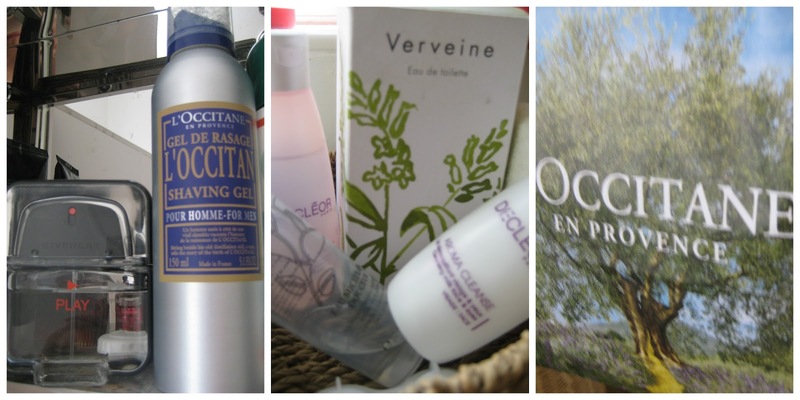 It has to be L'Occitane En Provence for the quality and products that really do work. I don't normally write about beauty but for this post,this is a one off. I love visiting the stores and the smell really takes you back to those times in France. My husband swears by the shaving gel and I love the shea butter hand cream for crafty hands. I love Fragonard scents too, I had to visit the museum on our honeymoon in Grasse and see first hand how these beautiful scents are created. They are now available in the UK through M&S, which is great news for getting a little bit of the south of France on your doorstep and in your bathroom cabinet! 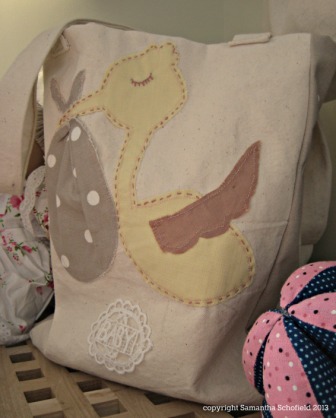 Over the coming days I'll post some of more favourite French things for cooking, baby and not to forget crafting. 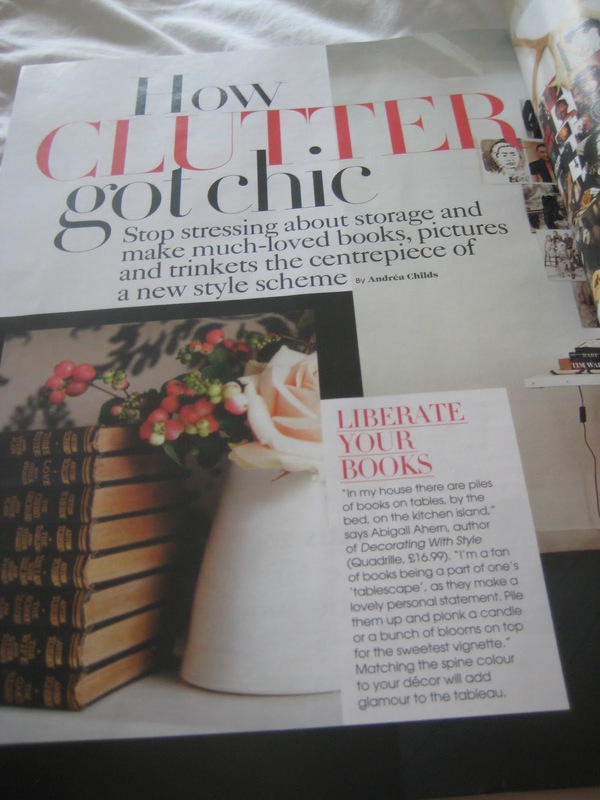 I had to write a post in response to the Clutter Chic article in this month's Easy Living magazine which is sadly the last printed copy before it goes digital. 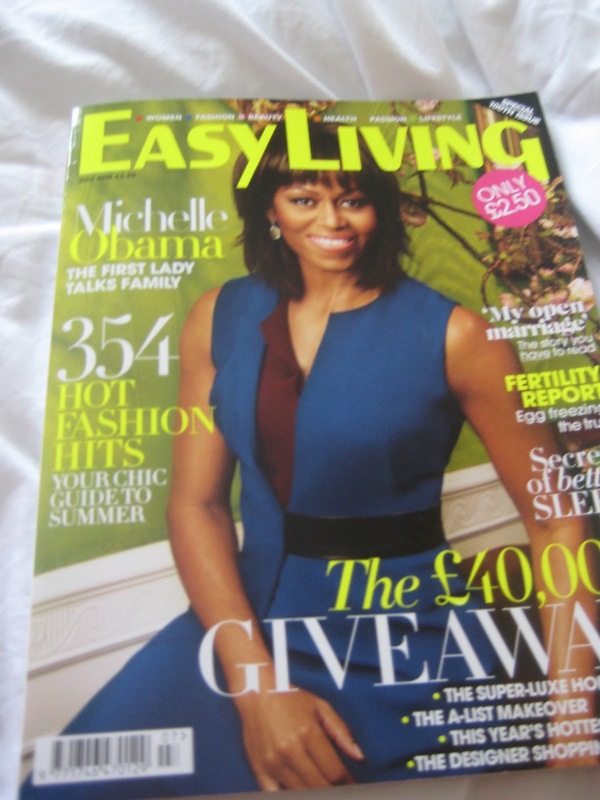 I have had this magazine since it started, I was a young grad living in London. It is the only title my Mum, Aunty and friends can read. Such a shame it has gone from our coffee tables. To say bye to one of my favourite titles, I have written about my love for stylish clutter. 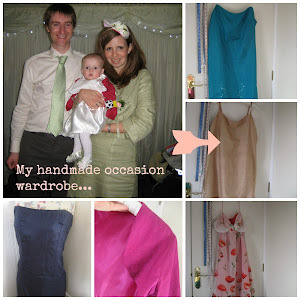 As you know from my blog, life is busy, I love vintage and crafting and making my house the heart of the home. 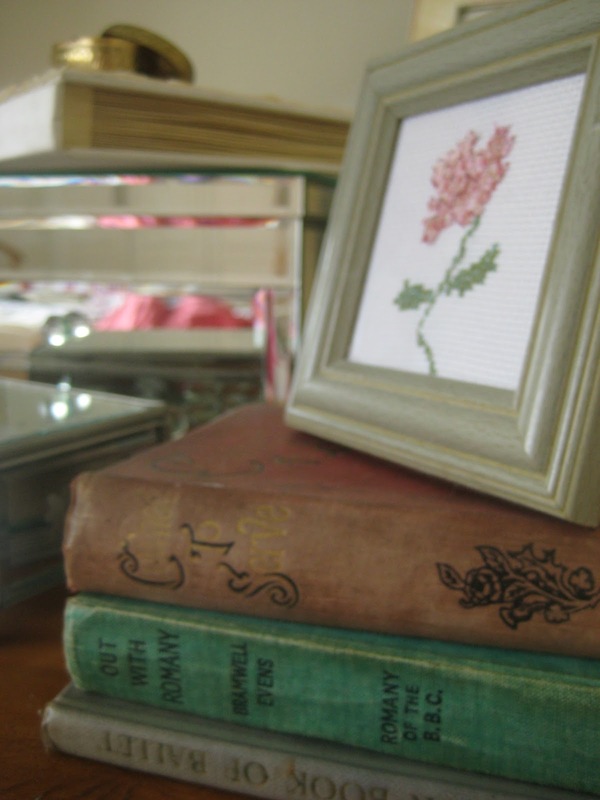 So I got out my lovely old books, favourite cross stitch and memory books and used the spaces in our home to display them. It does take a little more dusting time but it is lovely to see everything out on the sides to pick up read, reflect on and then put back for someone else to do the same. 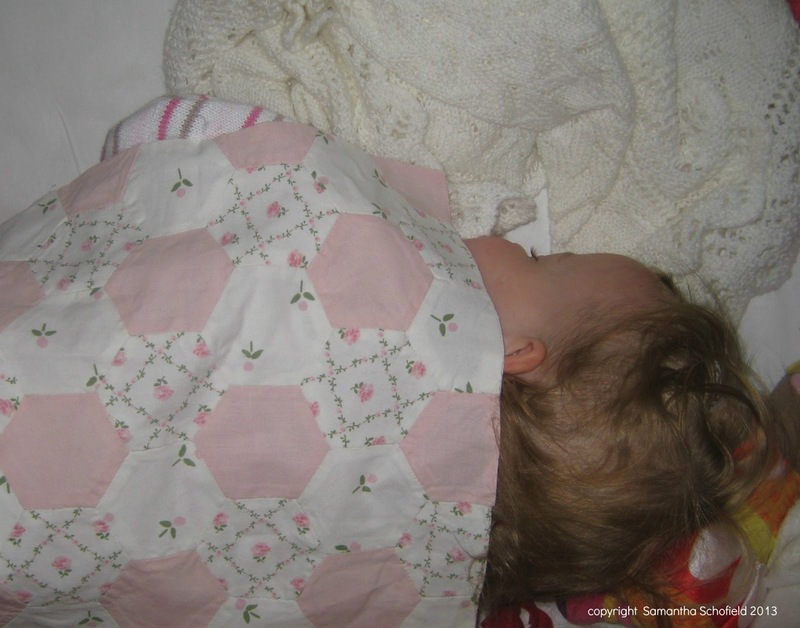 When Emma at Little Star Cottons asked me to guest blog I was delighted! 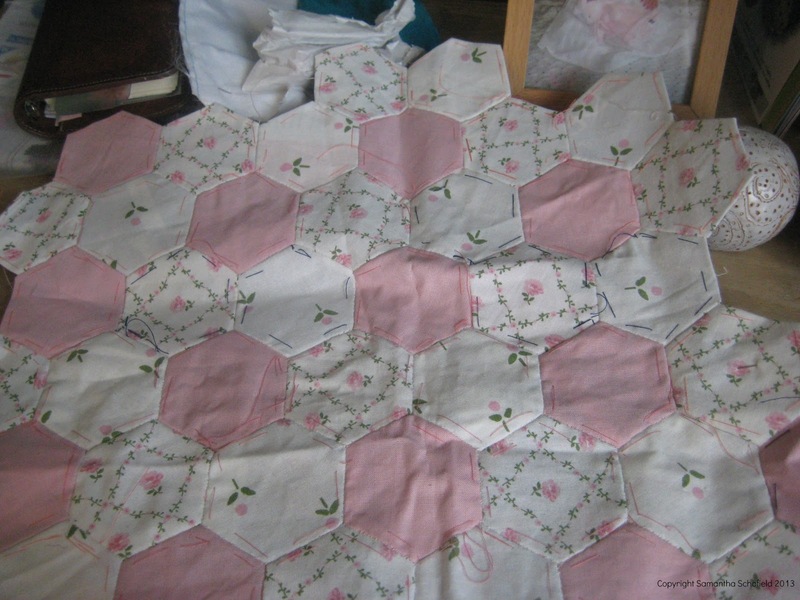 Love to know more hints and tips as I learnt from my Grandmother and most quilting books these days are for machine only. What is Slow Down Food? We are living in a fast, quick, on the go world and bringing up a family in a modern world sometimes means that we need to slow down. Slowing down in our eating means we eat well, good home cooked food and take time to enjoy it and the company we are in. 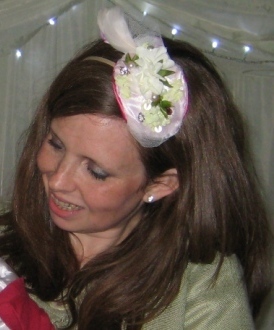 I recently attended a workshop where Amelia Horne from Jack Rabbits Kitchen Derby was a key speaker. Her business is based on bring good quality home cooked food into a restaurant environment. Cooking food slowly and eating in a WiFi free space. I also saw an interview with business woman Kareen Bradey who gets up at 6 a.m and puts a casserole in her slow cooker for the family. If Kareen can cook well with her schedule, I have no excuses! There is a slow move back to eating well and enjoying our food around the table. 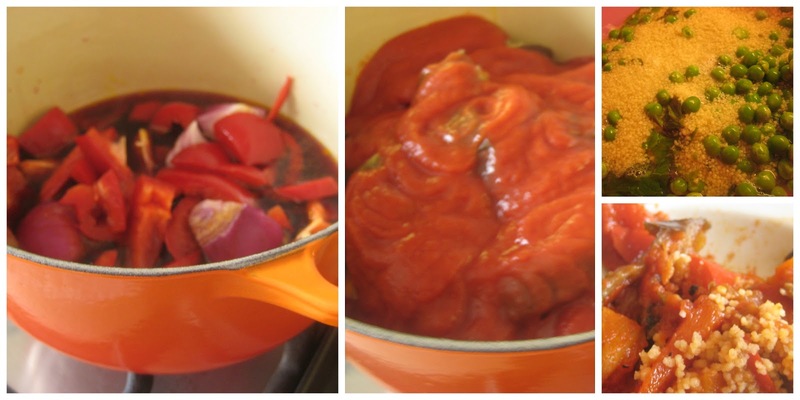 We had a gorgeous set of Le Creuset for our Wedding, it does weigh a tonne and I store it in low cupboards but it does a great job of cooking casseroles, tagines and stews slowly and is easy to clean. We had the classic orange but new colours come out each season and add a contemporary twist on a classic. I have to admit now I have a family and time in the kitchen is precious, I would be lost without my Le Creuset. The lid fits on perfectly so no twisting to fit in a little groove whilst your child has there hands in the oven! You can lift the lid, check if it needs a stir and pop the dish back in the oven quickly before your little one has time to run into the kitchen. Easy and safe! So for our slow down food Moroccan style, I made this simple tagine to serve with plain couscous, peas and a dash of lemon. This is the easy part, chop up all your vegetables. Saute to seal in the flavour on the hob for a few minutes. Add the drained tin of chick peas and the box of tomatoes. Stir in the spice and mint. Pop it in the oven at 150C for about 2 hours or lower for longer if you are out. Your vegetables will be soft and your tagine will be seasoned with so many flavours you will wonder why you have rushed before. There is a time, once a week when this or a similar recipe makes me bring out the Le Crueset and cook slow. 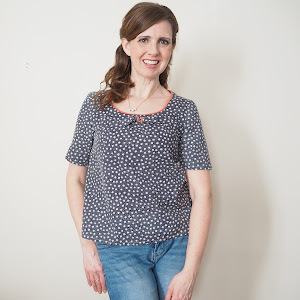 I haven't blogged for over a week, due illness, DIY, starting my crafty business (*coming soon*) and just any spare time spending it with the family. It seems that we don't get that much time together, so on sunny days it is great to get outdoors and enjoy those precious moments. But since midweek, the bug got the better of me and by Friday I was no use to anyone. 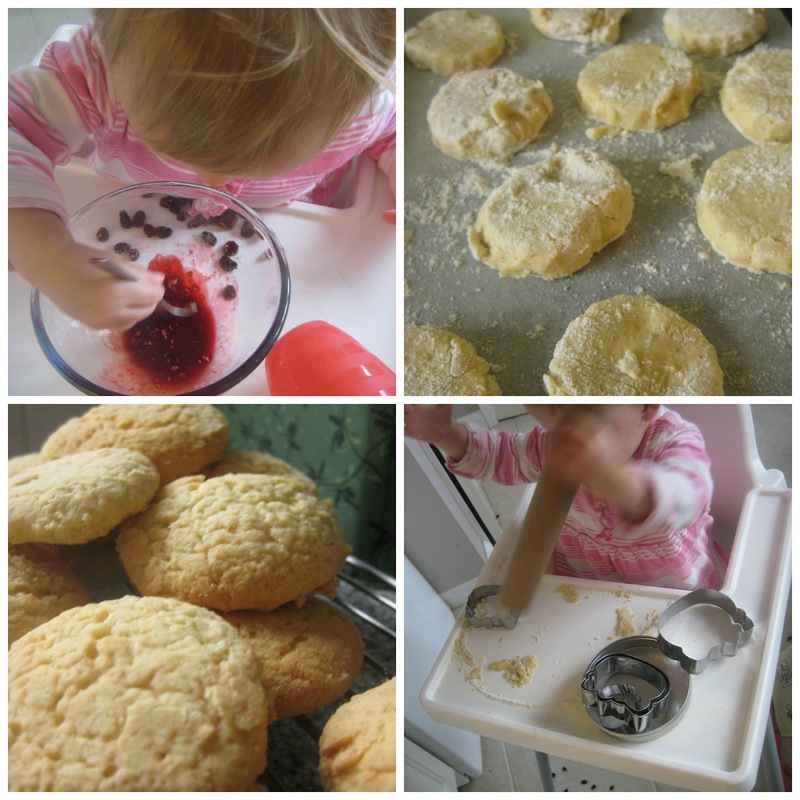 We make shortbread which is great fun, quick and easy. Mixing the ingredients together, watching me and then playing with the dough! 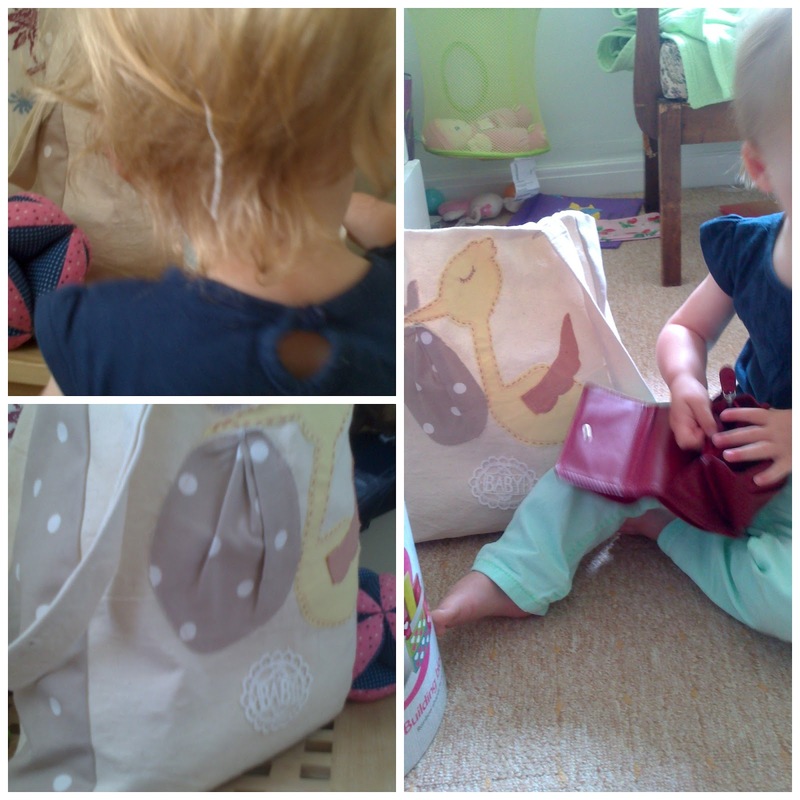 I gave Little L some food colouring to try and make some patterns with and some currents to add, cover, coat - whatever! The mixing and colour changes really kept her concentration. The rolling pin was substituted for a tin foil inner but she copied me and we made biscuits. I hope this is just the start of our cookery adventure together and we can eat home cooked food too. I really want to show her where our food comes from, how we grow it, mix it, bake it and then eat. I have just been in the garden and the raspberries are ready to be picked so any recipes for these would be greatly received.. Finally and probably a bit too late to the party but I have joined Instagram. 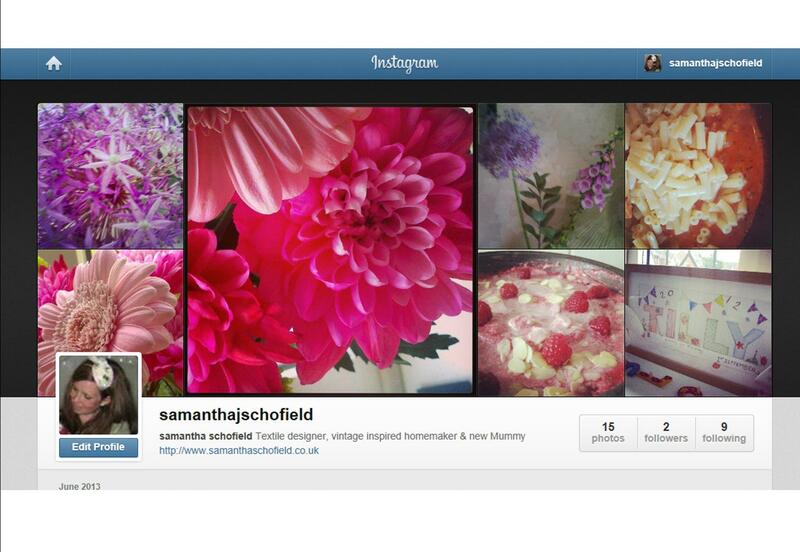 If you make lovely, inspiring crafts or create wonderful recipes, drop by and let me know how you are, I'm samanthajschofield .